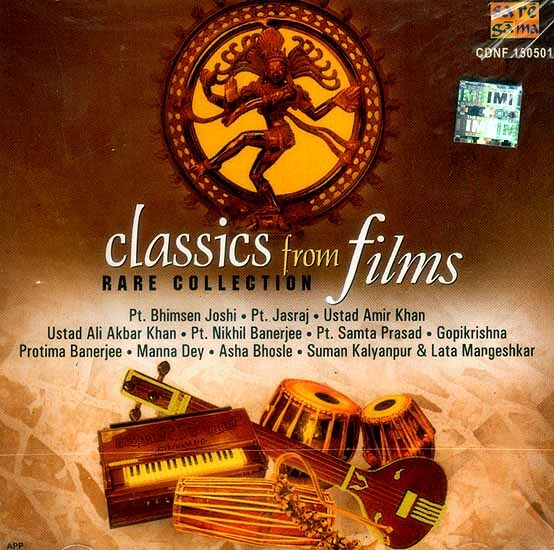 Hindustani classical music has played a major role in the development of the Indian film music. Most of the music directions in the early of the Hindustani film music had a strong background of classical music that used to reflect in their compositions. This quote in Sanskrit means that music is an amalgam of singing instrumental playing and dance. Our selections for this album underline the interconnection of these three faculties of music. Jhanak Jhanak Payal Baje (Hindi) - (music vasant Desai, Producer: V. Shantaram) in this movie we have Nrityariyaaz Shivtandav and Tabla Ghungru Jugalbandi by Pt. Samta Prasad and gopikrishna respectively. The versatile voices of late Mangeshkar, Asha Bhosle and Manna dey maintain the classical mood of the film. Ladki Sahyadriki (Hindi) produced by V. Shantaram also has music by Vasant Desai. The highlight of this film are the composition based on Raga Ahir Bhairav by Pt. Jasraj and Raga Pahadi Mand by Suman Kalyanpur. Kshudhita Pashan (Bengali) Music Ustad Ali Akbar Khan here we enjoy a classical vocal performance by Ustad Amir Khan. We also have a duet by Ustad Amir Khan and protima Banerjee. A sarod and Sitar Jugalbandi by Ustad Ali Akbar Khan and Pt. Nikhil Banerjee is also an attraction of this movie. Birbal my brother (English) Pt. bhimsen Joshi a starlwart of Kirana Gharana and Pt. Jasraj a Maetro of Mewati Gharana Have presented for this movie Raga Malkauns in Jugalbandi Form. It is very rare for you to come across such old and sparingly available classic classicals from movies based on Hindustani classical music. All renditions are by great playback singers from film music and maestros of Hindustani classical vocal and instrumental Music. These original tracks from the films are being released for the first time on cassette and compact Disc. It is a treat for connoisseurs.